(a) Fix the camshaft with a wrench, and then loosen the sprocket bolt. (b) Loosen and remove the bearing cap bolts on No. 2 camshaft (exhaust) in the sequence shown in the illustration in several passes, and remove the 5 bearing caps. (c) Raise the No. 2 camshaft (exhaust) and remove it. Then remove the sprocket bolt. (d) Disconnect the camshaft timing sprocket (with the timing chain) from the No. 2 camshaft (exhaust). (e) Remove the camshaft timing sprocket from the timing chain. (a) Loosen the bearing cap bolts on camshaft (intake) in the sequence shown in the illustration in several passes, and remove the caps. (c) Tie the timing chain with a string. NOTICE: Do not drop anything inside the timing chain cover. (a) Fix the camshaft (intake) with a vise, and make sure that the camshaft timing gear does not rotate. (b) Cover all the paths with vinyl tape except the advanced side path shown in the illustration. (c) Using an air gun, apply about 150 kPa (1.5 kgf/cm2, 21 psi) of air pressure to the port on the advanced angle side. CAUTION: Some oil spraying will occur. Contain the spray with a shop rag. (d) Under the condition above, check that the camshaft timing gear can be turned by hand to the advanced angle side (counterclockwise), the direction of the arrow in the illustration. HINT: The camshaft timing gear will turn to the advanced angle side without applying force by hand depending on the force of the air pressure applied. Also, if applying pressure to the oil path is difficult as a result of air leakage from the port, the lock pin may be difficult to be released. (e) Remove the fringe bolt from the camshaft timing gear. NOTICE: Be sure not to remove the other 4 bolts. If planning to reuse the camshaft timing gear assembly, release the straight pin lock first, and then install the gear. (a) Put the camshaft timing gear and the camshaft (intake) together with the straight pin and key groove. (b) Turn the camshaft timing gear (as shown in the illustration) while pushing it lightly against the camshaft (intake). Push further at the position where the pin gets into the groove. NOTICE: Be sure not to turn the camshaft timing gear to the retarded angle side (to the right direction). (c) Check that there is no clearance between the gear's fringe and the camshaft (intake). (d) Tighten the fringe bolt with the camshaft timing gear fixed. Apply a light coat of engine oil on the threads and under the head of the bolt. (e) Check that the camshaft timing gear can move to the retarded angle side (to the right direction) and is locked at the extreme retarded angle. (b) Examine the front marks and numbers of the 5 bearing caps and install them. Then install the 10 bearing cap bolts. Uniformly tighten the bolts in the sequence shown in the illustration. HINT: Apply a light coat of engine oil on the threads and under the heads of the bolts. (b) Raising the camshaft, temporarily tighten the sprocket bolt. (c) Examine the front marks and numbers of the 5 bearing caps and install them. Then install the 10 bearing cap bolts. Uniformly tighten the bolts in the sequence shown in the illustration. (d) Fix the camshaft with a wrench, and then tighten the sprocket bolt. 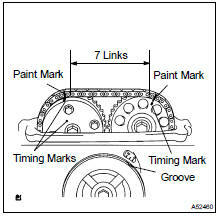 (e) As shown in the illustration, check the paint marks of the timing chain, camshaft timing gear and camshaft timing sprocket and the alignment of the pulley groove with timing mark of the chain cover.